HAMMOND, Indiana, January 13, 2011 (ENS) – The Northern Indiana Public Service Co. today reached a clean air settlement with the federal government and the state of Indiana that requires the electric utility to reduce air pollutants from its coal-fired power plants in Chesterton, Michigan City and Wheatfield and to retire its power plant in Gary, Indiana. NIPSCO has agreed to invest $600 million in pollution control technology that will protect public health and resolve violations of the Clean Air Act, the U.S. Environmental Protection Agency and the U.S. Justice Department jointly announced. 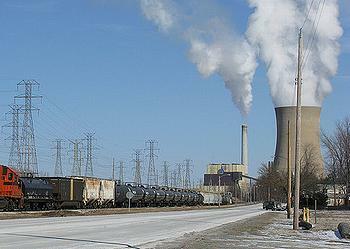 In September 2004, EPA issued a Notice of Violation to NIPSCO alleging that the utility modified a number of its coal-fired power units without first complying with Clean Air Act pre-construction obligations that include obtaining permits and installing and operating state-of-the-art pollution control technology. The settlement requires that NIPSCO pay a civil penalty of $3.5 million and spend $9.5 million on environmental mitigation projects. The projects include a clean diesel retrofit project for public vehicles, woodstove and outdoor boiler change-out projects and restoration of lands adjacent to the Indiana Dunes National Lakeshore. The state of Indiana has been involved in the development of this settlement and is a signatory. NIPSCO is the second largest electric distribution company in Indiana, with some 457,000 electric customers across the northern third of the state. Under the settlement, NIPSCO will reduce emissions by more than 64,000 tons annually. When all of the requirements of the settlement are completed in 2018, the utility says its nitrogen oxide, NOx, emissions will be 35 percent below current rates, sulfur dioxide, SO2, emissions will be 80 percent below current rates, and other benefits, such as reduced fleet vehicle emissions and improved air quality monitoring, will be achieved. Exposure to SO2 and NOx have numerous adverse effects on human health and are significant contributors to acid rain, smog, and haze. The EPA says these pollutants are converted in the air to fine particles of particulate matter that can cause severe respiratory and cardiovascular impacts, and premature death. The settlement requires NIPSCO to permanently retire its Dean H. Mitchell power plant in Gary. The facility has been out of operation since 2002 and its permanent retirement will ensure that the facility does not restart without proper permitting under the Clean Air Act. The company said today that its $600 million investment in new environmental control technology to improve air quality oer the next eight years will contribute hundreds of new jobs for locally contracted companies as well as new positions within NIPSCO. Since 1990, NIPSCO says it has reduced the NOx and SO2 emissions by 70 percent with investments of more than $350 million. “In part, due to environmental investments by NIPSCO, northwest Indiana was designated as an attainment area in 2010 for the first time since the 1990 Clean Air Act was adopted,” the company said, pointing out that attainment area status is a key factor in economic and community development. The settlement was lodged today in the U.S. District Court for the Northern District of Indiana, and is subject to a 30-day public comment period and final court approval.